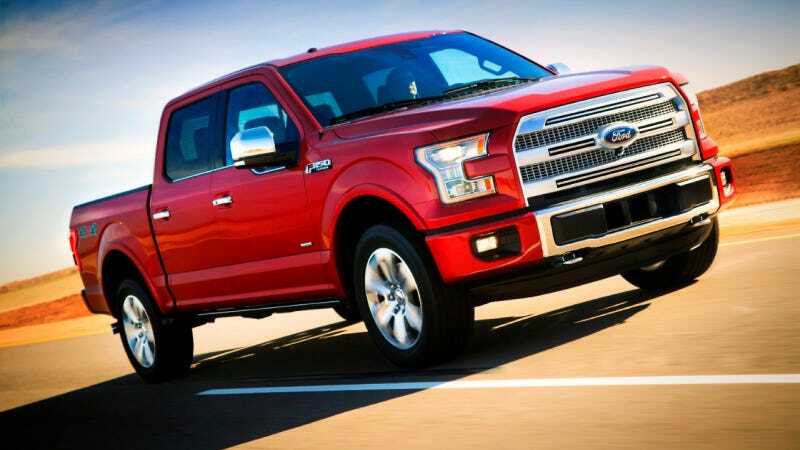 Ford has claimed more than 100 new patents building the 2015 F-150, meaning the truck will advance more in this generational changeover than it has between any previous generations. Watch some of those new innovations being torture tested right here. From its tailgate step to the LED spotlights found on the side mirrors, the next-generation 2015 Ford F-150's new features and technologies make it the most patented truck in company history. "The all-new F-150 is loaded with innovation," said Alana Strager, Ford program analyst charged with tracking new innovations for the 2015 truck. "Ford engineers filed more than 100 new patents for technologies on this truck as they have worked to redefine the light-duty pickup for the next generation." Patents and patent applications abound for state-of-the-art technologies covering new features and breakthroughs that will benefit customers of the all-new 2015 F-150. The scope of these innovations includes every part of the truck – body, exterior, interior, chassis, design, electrical and engine – as well as its manufacturing processes. Examples of Ford's state-of-the-art technologies on the new 2015 F-150 include segment-exclusive LED spotlights found on the side mirrors, innovative remote tailgate release and smart trailer tow features that make towing easier. • Ford's pioneering tailgate step has been completely reengineered so it fully integrates into the tailgate, making it virtually invisible when not in use. The tailgate drops down into position in one easy motion. The grab handle is now housed inside the tailgate, which keeps the inner surface of the tailgate uniformly flat. Other smart features never offered before on a Ford pickup include 360-degree camera view, integrated loading ramps stowed in the pickup bed, 400-watt power outlets inside the cab and LED headlights. Mounted on an exceptionally strong and well-proven high-strength steel frame, the all-new Ford F-150 incorporates the latest high-strength, military-grade, aluminum alloys to form the body and cargo box. The aluminum is heat-treated using a proprietary method developed by Ford engineers that nearly doubles the strength of the metal. Ford is first in the auto industry to use this methodology. Additionally, Ford engineers have filed patent applications for spot welding methods, adhesives and hydroforming this first-of-its-kind truck. "Ford is teaching the world how to build a next-generation truck, and the more than 100 patents filed by the F-150 team for technologies on the 2015 truck further proves these Ford engineers and designers lead the automotive industry in innovation," said Strager.